Vishnu told me that many SUV owners are afraid of trying offroading, fearing the possible damage to their pricy vehicles. By subjecting his SUV to extreme advetures, he is aiming to prove a point that SUVs are extremely capable and can negotiate tough obstacles without damaging themselves. While modifications do help, even stock versions are fairly capable. You can drive out a 4x4 SUV straight from showroom to an offroad adventure. Once you learn the capabilities of your vehicle and how to negotiate it in various terrains, the probability of damage starts to drop. To all the SUV owners out there- if you've bought a 30 lakh SUV paying 1 lakh in insurance every year and using it only for office commute, get out and get dirty. Explore the true potential of your beasts. Vishnu also said Mahindra Thar has changed 4x4 scene dramatically. [Mahindra Thar Review & Photoshoot ] It is affordable and can be used for offroad without any modifications. Earlier finding a mechanic who can fix/maintain a 4x4 system in a jeep was a challenge- not many people knew whom to approach for such things. Now it can be maintained by a Mahindra showroom. 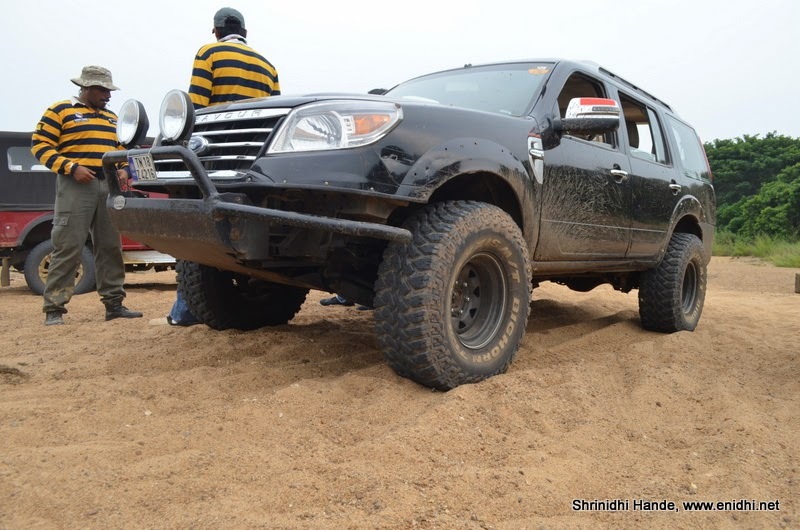 Terra tigers, headed by Mr Arka (Arkaprava Datta) have been conducting offroad events for over 10 years now. They frequently conduct events wherein jeep and SUV owners can register and learn offroading. We assembled at a farm near Pavanjur (Marg Tapovan is somewhere nearby). We saw this aged military truck, which I am told still works. It had too many gear levers- one of which is to operate the winch, which in this vehicle is powered by the engine, unlike battery operated ones in other cars. Mr Arka is reportedly trying to rebuild it. Best wishes to him. 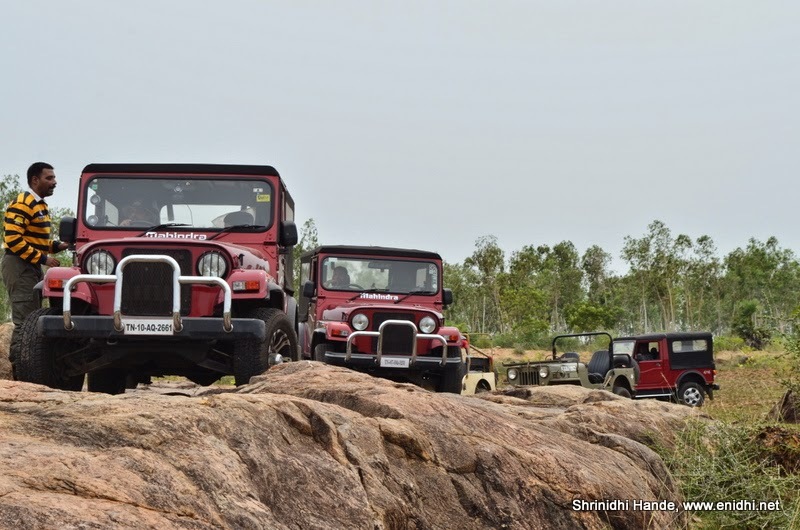 As suspected, most of the participants arrived in their Mahindra Thar 4x4. For many this was the first offroad experience. Soon Mr Arka arrived and the briefing session started. Apparently few new owners didn't knew much about the 4x4 lever in their Thar. The sales person at the showroom never briefed these customers about the 4x4 system properly. "Put it in this place and it will go forward" is what they were told, after defaulting the lever in 2H mode. Arka gave some briefing about the 4H and 4L positions. Another important aspect before offroading is to have a spare key ready. Particularly in an open jeep and while in the woods, if they key is lost it will be a nightmare. 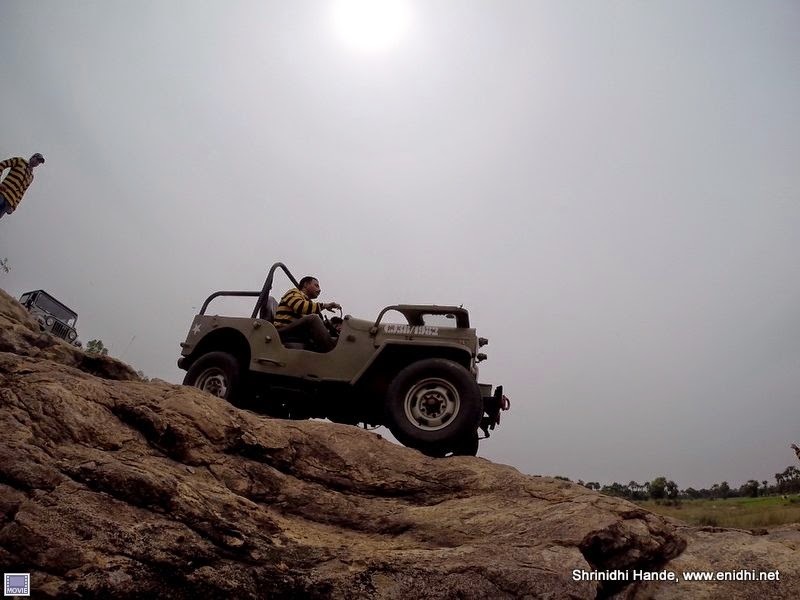 Old jeeps can be jumpstarted, but new Mahindra Thar is not that easy to start without a key. 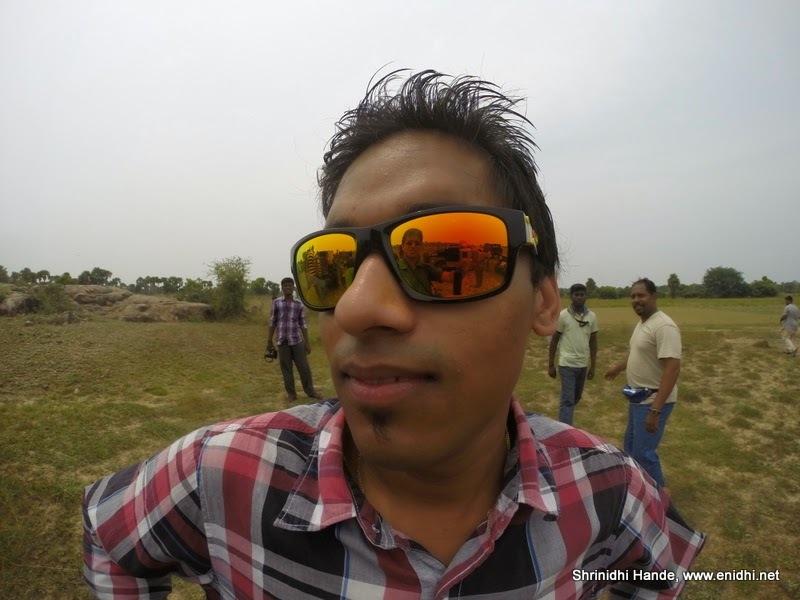 Terratigers team knows the Palar riverbed extensively and they know their way around in the area. Soon we left the farm and started in a convoy to our first obstacle, which was a rock. 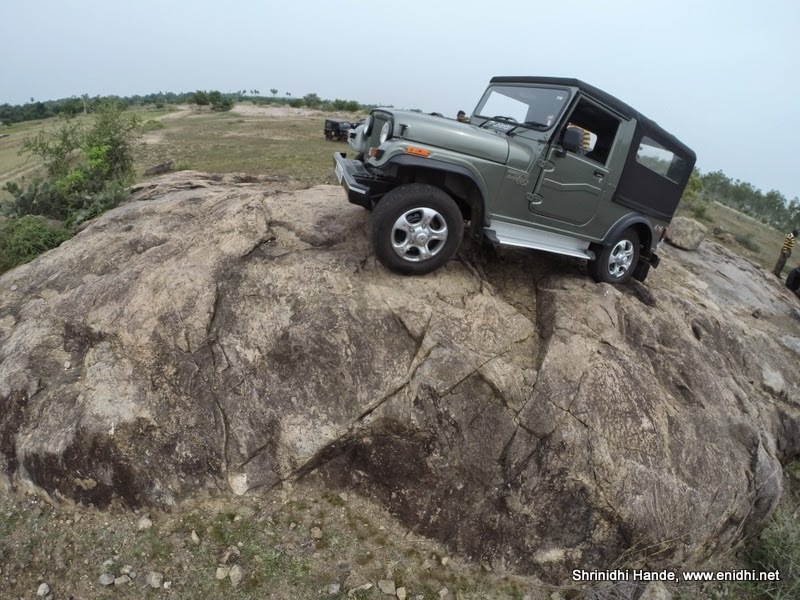 Mangalore boy Nischal Salian, who is an experienced offroader did the demonstration for the benefit of the audience, by climbing on the rock and getting off it without a scratch. Spotters took positions to guide the drivers and one by one jeep drivers negotiated the rocks. Many got minor scratch on the rear bumper and leaf-spring while trying to get off the rock. I sat inside a Thar as passenger and shot the experience onboard. I was tempted to ask one of them if I can try the same in their jeep, but held back my temptation. Unlike a rented car, this is someone else's personal car- even if they let me drive it reluctantly, it is a bigger risk if the vehicle suffers any damage while in my command. There were no limits to the number of attempts one could try, which is a good thing with Terratigers. One of the main risk in situations like this is the risk of toppling over. Again the mantra of "be as slow as possible, but retain as much speed as necessary" came into effect. Spotters would advise the driver on the right path and to proceed or not and drivers need to follow the instructions. For few who were driving a bit fast, Arka intervened and either advised them to drive carefully or took the driver's seat and demonstrated the right way of handling the obstacle.